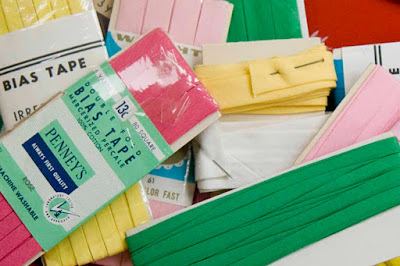 As I've often told, the first time I saw binding tape was in the top of my Mum's wooden sewing box. The then strange packets of coloured tape wrapped around card looked pretty uninspiring compared to the sumptuous threads beneath. Little did I know that this unassuming product would become of much interest in years to come. When William Enos Wright developed his idea to produce folded tapes in the late 19th century, I doubt he reckoned on his product still being on sale 125 years later! By the depression in the 1930s, the use of binding tape had boomed as a cheap way of smartening up textile items. 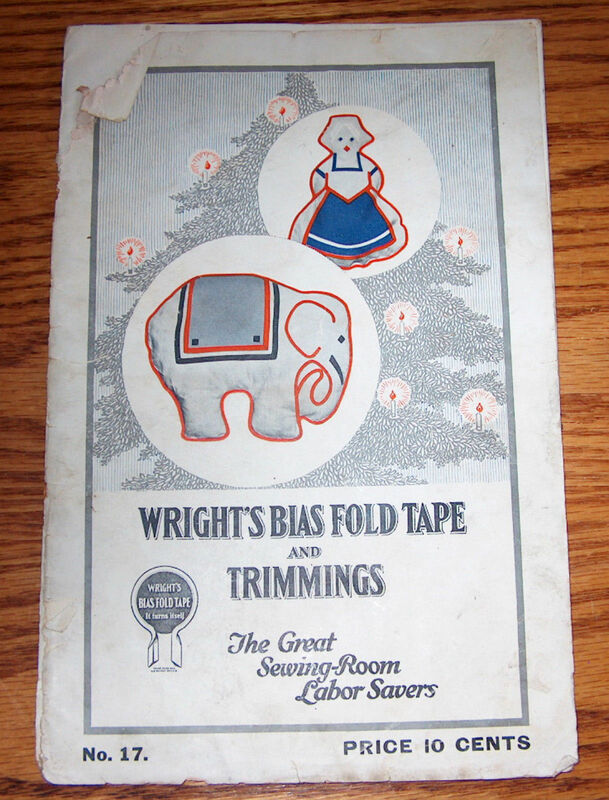 A series of booklets were produced showing how to use bias fold tape on pretty much anything textile - such as a bias edged negligee, marble bag and bird cage cover as in this edition! The use of bias tape in the 21st century may not be quite so prolific. 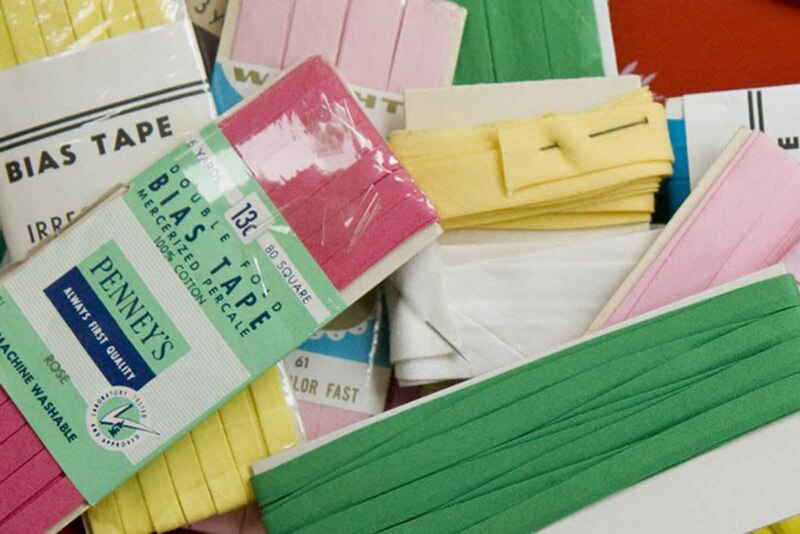 However when you look closely at textile items, it's surprising just how often binding tape has been used and binding tape is now sold in endless colours and patterns. 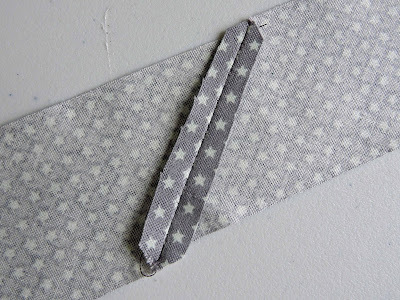 Although far better I think to make your own binding tape - which is pretty easy as at the end of the day, it's a strip of folded fabric! First I'll touch on a little terminology. 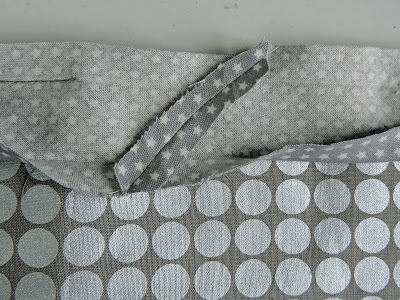 The binding tape I most often use is 'single fold' as above - which is where both the long raw edges of a cut fabric strip are folded in to meet - right fabric side out. As for the cutting of fabric strip, the fabric 'grain' from the weaving process becomes all important - be it across the fabric weave, straight down the weave or on the bias. True bias binding is cut diagonally across theses grains at 45 degrees to give a stretch which can be very useful when applying. 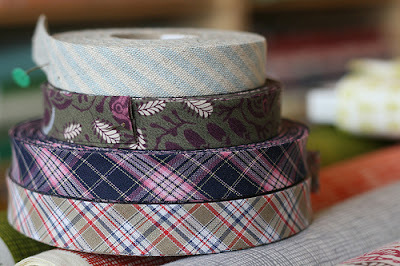 The width to cut the fabric is usually twice the width of the tape required or four times the ultimate edging required. 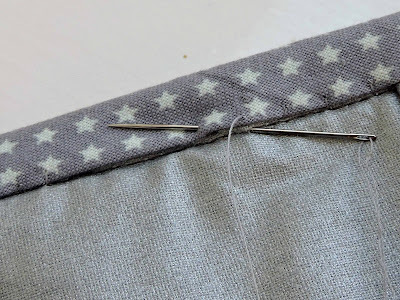 Joining strips is often required to create the required length and I always join diagonally as shown - even when I cut with the fabric grain. 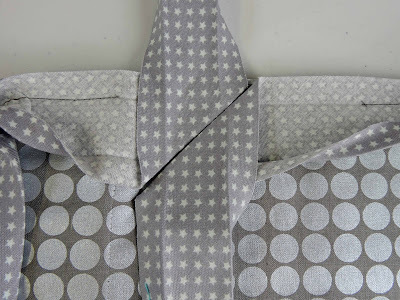 After stitching across the line as marked above, I cut back the excess fabric and give a quick press - worth the extra few seconds for a neater finish. Next to press in the folds - which of recent years I've done with a rather nifty binding making machine. 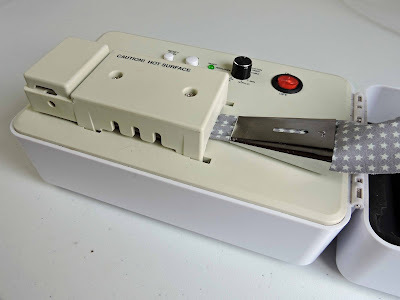 Starting around £40, this Simplicity machine isn't the cheapest stitch gadget on the market. However for those who use binding in any volume, it's worth every penny. Simply push the end of the cut fabric strip into the correct size tip and press the run button and you quickly have perfectly pressed tape every time. No worries if your pocket doesn't stretch to a nifty gadget. 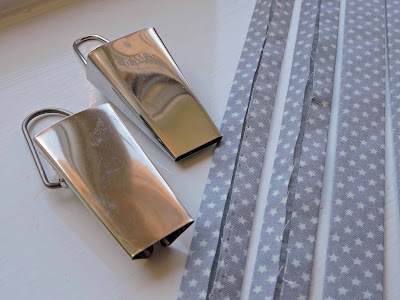 I made bias tape by hand for many years and you can buy standalone tips to use with a conventional iron very cheaply in lots of sizes . To start stitching the tape to your chosen project, first unfold one side of the tape. 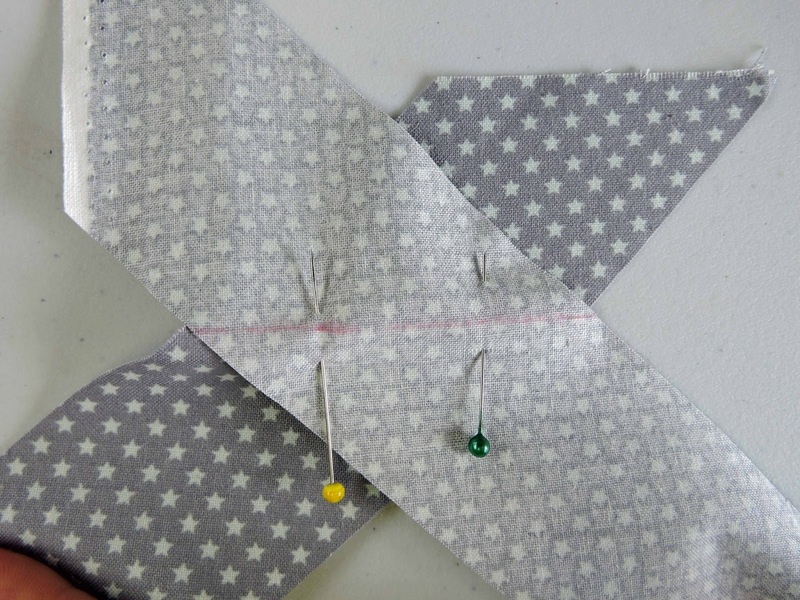 If you're looking to join the start and the end of the binding, do not start at a corner and leave a good 6" or so excess of tape before you start stitching. Align the unfolded raw tape edge with the raw edge being bound and then stitch down the fold line. Very important to stitch straight and keep those raw edges aligned. Dealing with corners can be a bit fiddly to negotiate and there are various ways depending on whether the corner is square or curved. For this piece of work my edge was curved and it was a matter of easing around with plenty of excess and not pulling too tight. Where the bias edge end meets the start, I've found the easiest way to do this is to stop stitching a good 6 or so inches from where you started. Fold the excess tape at the start diagonally in one direction and the excess tape and the end in the other direction. Press to get firm creases. 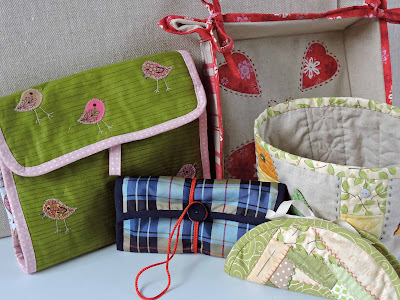 Match the folds and stitch across in the same way to join as explained further up this post. 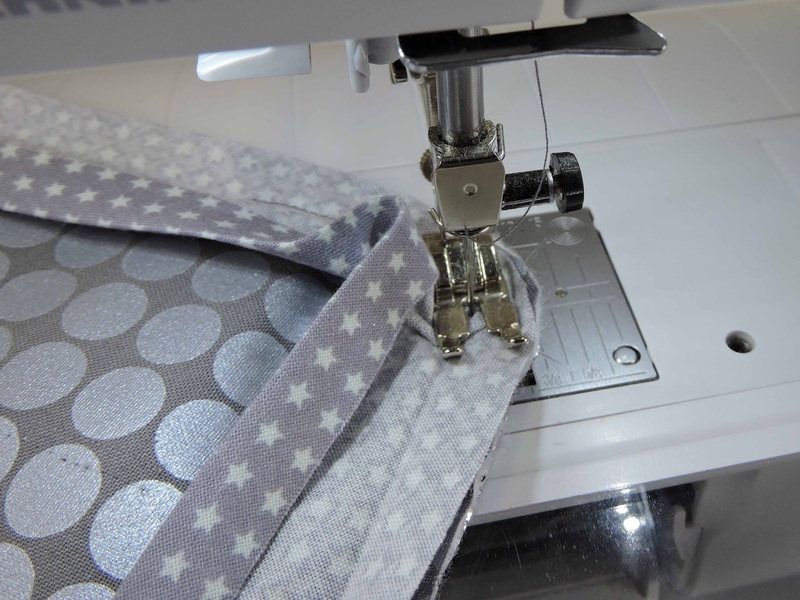 Once you get to this position you can finish stitching in place and you will have a snug fit. 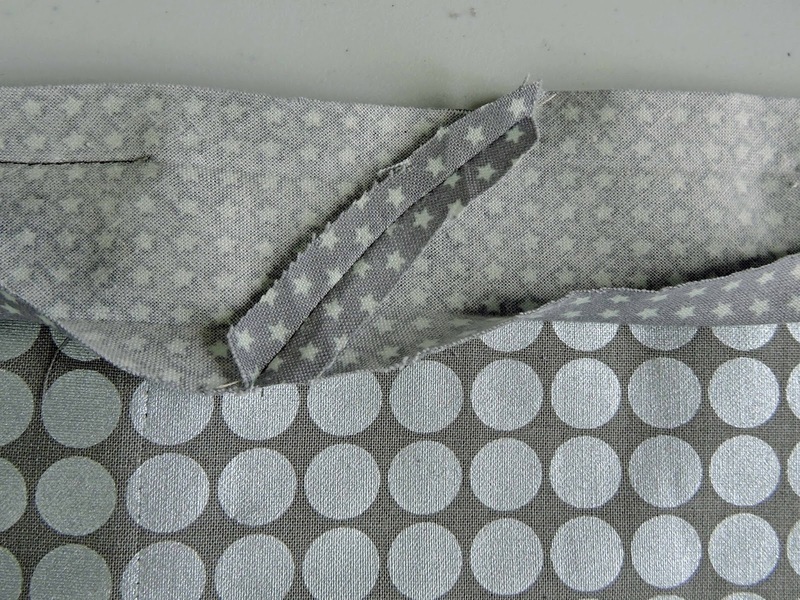 Last but not least is to fold over the binding and stitch on the other side. This can be done by hand or machine and just depends on how much time you have and the look you most like. 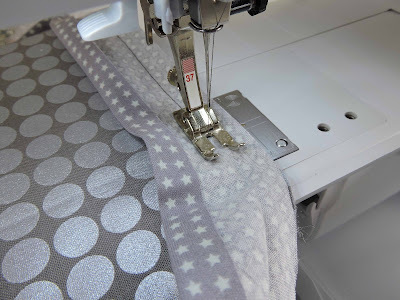 I use both methods, although I do tend more to the hand finish where using this 'blind stitch' there is no stitching visible on the binding edge. After such an uninspired start, I'm surprised just how much I've taken to using binding tape in my stitch projects. Making my own was very much the turning point as the possibilities of colours are infinite and the quality is so much better than commercial tape now on sale - which tends to be very thin with measly fold overs. I have a mind that this small selection of recent workshop projects with bound edges will soon be joined by many others!